The Behringer U-PHORIA UMC1820 is a professional audiophile 18x20 USB audio/MIDI interface that has a sampling rate of 24Bit/96kHz and features the legendary MIDAS microphone preamplifiers. Suitable for either studio applications or for being used in live scenarios the Behringer U-PHORIA UMC1820 is a fantastic USB audio/MIDI interface. Record the perfect vocal right to your computer-based DAW thanks to the 8 astonishingly clear, world-class MIDAS-designed mic preamps, which include +48 Volt phantom power for condenser microphones, all going through studio-grade 24-Bit/96 kHz converters for the best possible sound quality. It also provides I/O support for S/PDIF, ADAT and S/MUX formats. Whether youre a singer-songwriter, producer on the go, or just need a rock-solid interface for running backing tracks at a gig, the ultra-dependable U-PHORIA UMC1820 will help you shine in the digital domain. 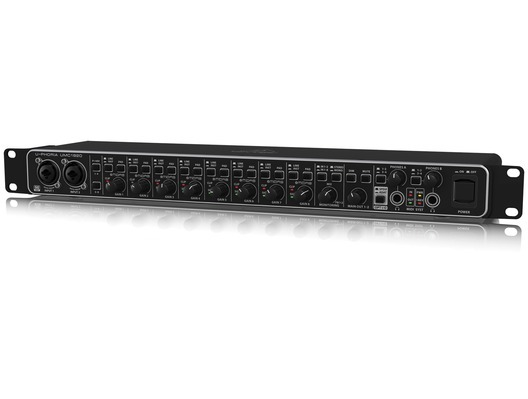 When its time to make recording history on your Mac or Windows computer, plug in microphones, instruments or line level sources to the UMC1820s 8 combination XLR/TRS inputs for the ultimate in studio flexibility! Connect and communicate with MIDI devices to add the benefit of control surfaces to your studio workflow. And since the UMC1820 is compatible with all popular recording software including Avid Pro Tools, Ableton Live, Steinberg Cubase, and others its ready for anything. MIDAS has earned their impeccable reputation due to their no-compromise approach for audio and build quality and in particular for their Award-winning Mic Preamps which are considered by industry experts as the industrys best sounding designs. Building on this legacy, the XL8 and PRO Series of Live Mixing Systems continue this great heritage of Award-winning audio quality. The UMC1820 mix control allows zero-latency direct monitoring, which means musicians can experience their performance clearly and with no delay or lag in the returning signal, resulting in a better performance and recording. Its powerful phones output has its own level control and Monitor A/B source select for DJ-style cueing. The U-PHORIA UMC1820 provides 18 inputs and 20 outs and built-in MIDI I/O to sync your favorite hardware. Youll have ultra-easy control via your computer for producing a richer performance. On the rear panel of the UMC1820, youll find the USB 2.0 port for hassle-free connection, and plenty of analog playback output options including ¼" TRS, RCA and XLR. Built-in MIDI I/O allows you to connect keyboards and other outboard MIDI hardware. The U-PHORIA UMC1820 is a powerful 18 input, 20 output USB recording interface featuring genuine MIDAS-designed mic preamps with exceptional 24-Bit/96 kHz high-resolution converters, support for S/PDIF, ADAT and S/MUX formats with simultaneous use of all signals. Its all designed to help your recordings and mixes sound their absolute best. Visit your local dealer or online reseller and fi nd out what a great addition to any studio or mobile recording rig it can be.